A Matchmaker…. I’m Not That Desperate! A common myth about going to a professional Matchmaker is that it is for desperate people, people who have run out of options, and people who just can’t seem to get dates. The truth is that our clients are not desperate people, they are often selective and particular, and want the help of a professional in finding the quality partner they seek. 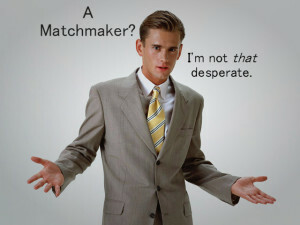 Going to a professional Matchmaker isn’t for desperate people, it’s for people who want success in their love life.